To put this year’s winter cold into perspective, there is an informative article by Jon Erdman at weather.com America’s Coldest Outbreaks January 17 2018 Excerpts with my bolds and showing CO2 concentrations at the referenced dates. Note that temperatures are in degrees Fahrenheit. The Clear Number 1 February 1899: Atmospheric CO2 295 ppm. The cold wave during the first two weeks of February 1899 is by far and away the gold standard for cold outbreaks in U.S. history. What made this outbreak worthy of its lofty status was the magnitude, areal coverage and longevity of the cold. For the first and only time on record, every state in the Union (recall, there were only 45 states at the time) dipped below zero. Subzero cold invaded parts of south-central Texas, the Gulf Coast beaches and northwest Florida. Tallahassee, Florida, dipped to -2 degrees on Feb. 13, 1899, the only subzero low in the city’s history. This remains the all-time record low for the Sunshine State. All-time record lows were set in a dozen states, from the Plains to the Ohio Valley, Southeast and District of Columbia. In addition to Florida, state record lows in Louisiana (-16 in Minden), Nebraska (-47 in Camp Clarke) and Ohio (-39 in Milligan) still stand today. Dozens of cities still hold onto their all-time record low from this cold wave, including Atlanta (-9), Grand Rapids, Michigan (-24), and Wichita, Kansas (-22). Temperatures as frigid as -61 degrees (Montana), -59 degrees (Minnesota) and -50 degrees (Wisconsin) were recorded. The Mississippi River froze solid north of Cairo, Illinois, and ice not only clogged the river in New Orleans, but also flowed into the Gulf of Mexico a few days after the heart of the cold outbreak. Ice jams triggered floods along parts of the Ohio, Tennessee, Cumberland and James Rivers. Ice skating was the activity of choice as the San Antonio River froze. Lacking snow cover, the ground froze to a depth of 5 feet in Chicago, damaging water, gas and other pipes. New York City engineers found trusses on the Brooklyn Bridge had contracted 14 feet due to the cold, according to Extreme American Weather, by Tim Vasquez. Due to frozen aqueducts from Catskills reservoirs, the city of Newark was forced to draw water from other rivers and bays. Adding insult to injury, a massive snowstorm punctuated the cold outbreak from the Gulf Coast to New England Feb. 11-14. Cape May, New Jersey, picked up 34 inches of snow, the nation’s capital was buried by 21 inches and 15.5 inches fell in New York City, overwhelming city crews and isolating suburbs. In Florida, snow fell in Fort Myers, Tampa saw measurable snow for one of only two times in its history, and Jacksonville picked up 1.9 inches of snow. New Orleans was blanketed by 3 inches of snow. 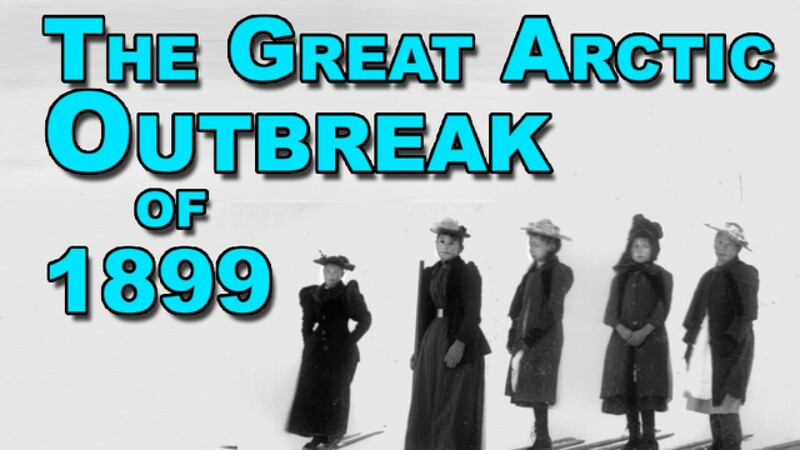 Here are some other notable cold outbreaks since the massive 1899 outbreak. Ice builds up along Lake Michigan as temperatures dipped well below zero on January 6, 2014 in Chicago, Illinois. 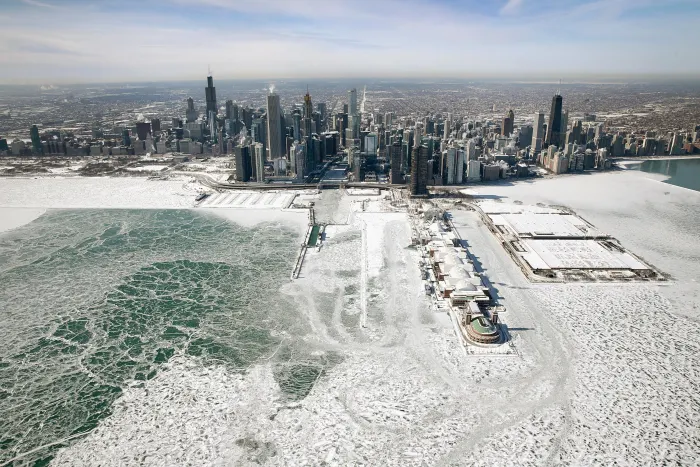 Chicago hit a record low of -16 degree Fahrenheit as an arctic air mass brought the coldest temperatures in about two decades into the city. – December 2013 – February 2014 was among the top 10 coldest such periods on record in seven Midwest states. 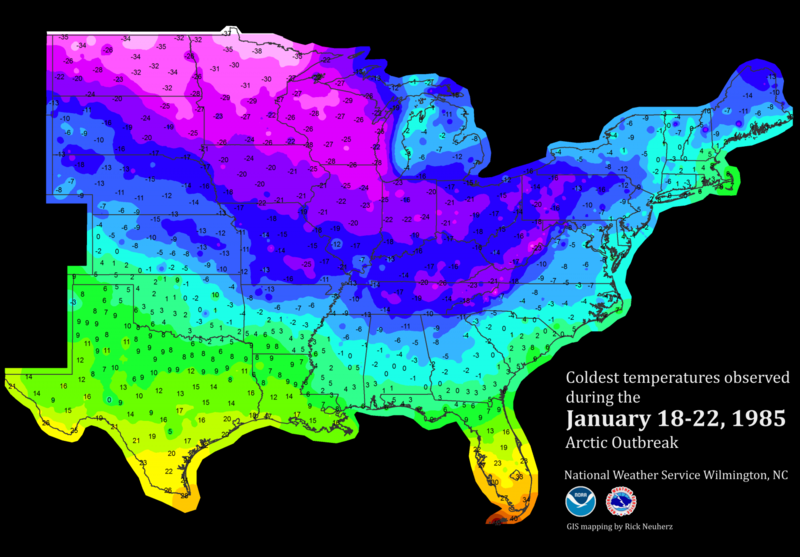 – An early January 2014 outbreak brought the coldest temperatures of the 21st century, to date, for some cities. – The winter was among the top five snowiest on record in at least 10 major cities. – Minnesota state record: -60 degrees near Tower on Feb. 2, 1996. WCCO radio’s Mike Lynch broadcasted live from Tower that morning, during which he blew soap bubbles which then froze on the ground as a crowd watched. – All Minnesota public schools shut down. – Fears of natural gas shortage in northern Illinois prompted requests to reduce consumption. – 14 cities set all-time record lows, including Indianapolis (-27), Cleveland (-20) and Harrisburg, Pennsylvania (-22). Pittsburgh (-22) beat its previous all-time record set during the February 1899 outbreak. – Both Pittsburgh (52 hours) and Cleveland (56 hours) set their record stretch of subzero cold. – 35 counties in Ohio plunged to -30 degrees or colder on Jan. 19. – Worcester, Massachusetts, had seven straight days with subzero lows, a record stretch. – Crown Point, New York, dipped to -48 degrees on Jan. 27. – Coldest month on record in Caribou, Maine, with an average temperature of -0.7 degrees. – Most destructive freeze in California since 1949. Fifty percent of California’s citrus crop damaged. – Randolph, Utah, bottomed out at -45 degrees on Dec. 22. – All-time record lows in Kansas City (-23), Topeka, Kansas (-26), Lake Charles, Louisiana (-4), and Wilmington, North Carolina (0). – First Christmas Day snow (trace) on record in Tallahassee. Miami had a rare freeze while Key West dipped to 44 degrees. – 14 inches of snow fall at Myrtle Beach, South Carolina, on Christmas Eve. – At the time, it was the fourth coldest December on record for the entire U.S.
Due to the cold, President Ronald Reagan takes the oath of office for his second term as President in the Capitol Rotunda on Jan. 21, 1985. – 13.2 inches of snow in San Antonio, Texas (Jan. 12), crushed the previous 24-hour snow record, there. Austin and Houston (3 inches each) also were blanketed by this snowstorm. – State record lows were set in Virginia (-30 at Mountain Lake) and North Carolina (-34 atop Mt. Mitchell). – Ronald Reagan’s second inauguration was the coldest Inauguration Day on record (7 degrees). The ceremony was moved indoors and parade cancelled. – $2 billion damage to agriculture, mainly due to freezing temperatures in central and northern Florida. – As measured using the old formula, wind chills reached 100 degrees below zero over much of North Dakota on Dec. 22. – Sioux Falls, South Dakota, remained below zero from the morning of Dec. 16 until Christmas Day afternoon. – Over 125 daily low-temperature records were broken on Christmas Day. Tampa’s Christmas Day high was only 38 degrees. Remembering the “Freezer Bowl AFC Championship game in Cincinnati, Ohio on Jan. 10, 1982. – 85 deaths were attributed to the cold wave, according to the National Climatic Data Center. – Chicago’s O’Hare and Midway Airports set all-time record lows (-26). – Milwaukee, Wisconsin, plunged to -26 degrees on Jan. 17, their coldest temperature in 111 years. – Montgomery, Alabama (-2), Jackson, Mississippi (-5), and Atlanta (-5) each plunged below zero. – Snow at rush hour on Jan. 11 slickened streets, stranding motorists in Atlanta. – Natural gas lines froze, and up to 7 million experienced brownouts, according to Tim Vasquez. – The second coldest game in National Football League history, the “Freezer Bowl”, was played in Cincinnati, where a kickoff temperature of -9 degrees greeted the warm-weather San Diego Chargers. – Hundreds of cases of frostbite were treated at the stadium, including Bengals quarterback Kenny Anderson’s frosbitten ear. 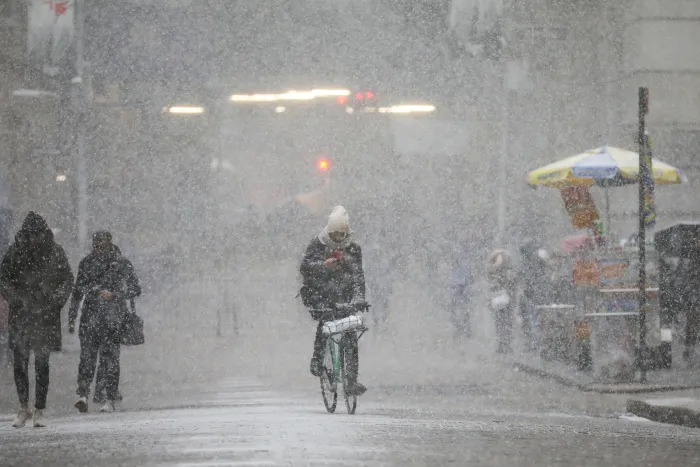 – 69 first-order weather stations shivered through their record coldest month, according to Weather Underground’s Christopher Burt. – Temperatures did not rise above freezing the entire month in a swath from eastern Iowa to western Pennsylvania northward, according to Burt. – Snow fell as far south as Miami and Homestead, Florida, the farthest south occurrence of snow in the U.S. Two inches of snow fell in Winter Haven, Florida. – 35 percent of Florida’s citrus crop was damaged; rolling blackouts were needed in Florida due to heavy power demand. – President Jimmy Carter walked 1.5 miles in the Inauguration Parade with temperatures just below freezing on Jan. 20. – The “Buffalo Blizzard of ’77” added a foot of snow to the 33 inches of snow on the ground, accompanied by wind gusts to 75 mph, producing snow drifts up to 30 feet high, paralyzing the city. – Coldest month on record in Boise, Idaho, and Spokane, Washington. – Coldest winter at virtually every weather station in California, Nevada, Idaho and Oregon, according to Burt. 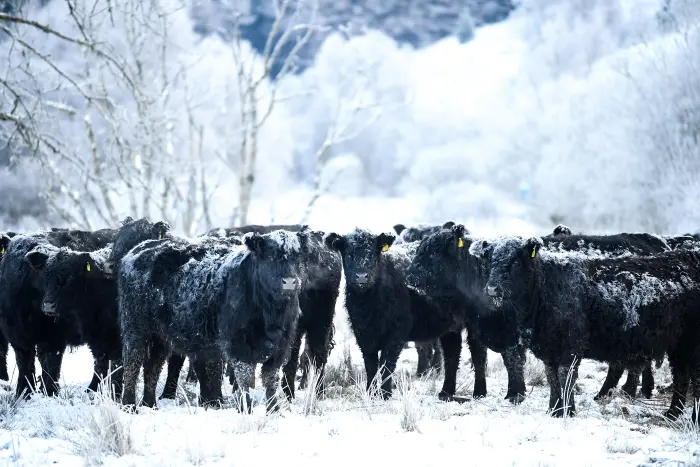 – A series of blizzards in the Great Basin and Plains claimed 150,000 sheep and cattle, isolating ranches from Wyoming to South Dakota. – The Army airlifted supplies to snowbound ranchers. – Snow fell in San Diego. One of only three measurable snowfalls on record in Downtown Los Angeles, as well. – All-time record low set in San Antonio, Texas (0 degrees). – Coldest Plains winter of record. – Low temperatures dropped below -50 degrees on four separate days in Malta, Montana. – Parshall, North Dakota, plunged to -60 degrees on Feb. 15, still the state record low today. – Langdon, North Dakota, remained below zero for an incredible 41 straight days, the longest stretch on record in the Lower 48 states, according to Burt. Clearly CO2 neither causes nor prevents outbreaks of arctic cold invading North America. Concerning ourselves with GHGs is no substitute for ensuring reliable, affordable energy and robust infrastructure. Jonathan Erdman is a senior meteorologist at weather.com and has been an incurable weather geek since a tornado narrowly missed his childhood home in Wisconsin at age 7. In the January 1985 chill I learned that a 5-year-old battery will freeze at abt -25F, while driving the car. On a country road half way between Kalamazoo and South Bend. I also learned that if it is windy replacing the battery outside is quite a treat. If you would like to read more (for comment, critique, correction, or suggestions) I would be happy to provide you with a Dropbox link to the pdfs for each section of the contents. About to look for a publisher for what will be a timely book (given the political winds and the upcoming 2020 political season) that offers compelling evidence based not on opinion, but the best data records available (primarily the US governments global annual averages for CO2 emissions, atmospheric CO2, and near surface temperatures for land, ocean, and merged land+ocean regions; the 800,000-year Vostok ice core analyses; the geologic evidence for CO2 and temperatures for the past 550-million years and climate for the 3.5 billion years), challenging the climate change narrative. The book is loosely constructed as a “trial” in the court of public opinion where the defense has generally been told to “sit down and shut up.” Now, with The Scientific Method added to the defense team (the IPCC and its agents are the prosecution), the testimony of evidence supporting defendants CO2 and fossil fuel CO2 emissions cross-examine and deconstruct the prosecution’s assumption-based case. The target audience are people who are concerned and/or interested in this case but who have no particular scientific background and require perspective on historic climate and the claims of the “greenhouse effect” and CO2 in particular. The prosecution’s “greenhouse gas climate change theory” is only referenced in terms of what it claims, no attempt to delve into the scientific problems with the theory is made (an effort that would quickly lose the target audience). Terms used are defined in a glossary and The Scientific Method is discussed early in the book and again it is defined in the glossary. The book deconstructs these charges providing compelling evidence there is no evidence to support them, indeed, the best evidence available unequivocally refutes them. Indeed, Chapters 4 and 5 can be skipped because Chapters 6 and 7 clearly demonstrate that atmospheric CO2, regardless of its source of growth, is not a climate change force. Let me know if you’d like any more pre-publication material. I am about to approach some publishers, and will self-publish an eBook if necessary to get this timely look at the evidence information out. I know you’re well-informed and have already been convinced, but I thought you might find the material, particularly the new graphic presentations I’ve designed, interesting. Also, if you have any publisher tips, I’d be glad to have them! Thanks Bob for the heads up. There was no problem with those images on my machine, but to be sure I copied the images to my own blogsite. Your offer is interesting. I will be occupied out of the country for about two weeks but could lend a hand after that. Bob, would I be able to get a draft of your book please?